PowerPoint allows text and numbers to be presented in tabular form (aligned rows and columns) in a reasonably flexible way. A PowerPoint table is not nearly as functional as an Excel spreadsheet, and is definitely less powerful than a table in Microsoft Word, but it serves well for most presentation purposes. A table is a matrix of cells arranged in aligned rows and columns. This orderly arrangement allows a reader to more easily make sense of relatively large number of individual items. It is commonly used for displaying numbers, but can also be used for blocks of text. An individual content “container” within a table. A cell has a text-frame in which it holds that content. A PowerPoint table cell can only contain text. I cannot hold images, other shapes, or other tables. A cell has a background fill, borders, margins, and several other formatting settings that can be customized on a cell-by-cell basis. A side-by-side sequence of cells running across the table, all sharing the same top and bottom boundary. A vertical sequence of cells spanning the height of the table, all sharing the same left and right boundary. The underlying cells in a PowerPoint table are strictly regular. 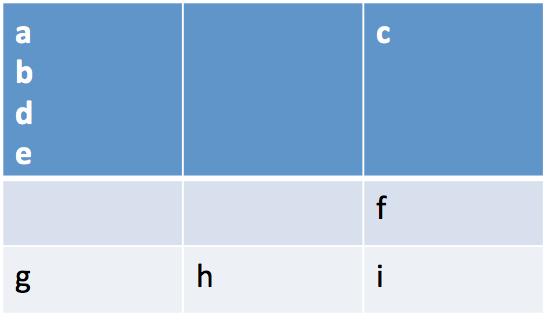 In a three-by-three table there are nine grid cells, three in each row and three in each column. The presence of merged cells can obscure portions of the cell grid, but not change the number of cells in the grid. Access to a table cell in python-pptx is always via that cell’s coordinates in the cell grid, which may not conform to its visual location (or lack thereof) in the table. A cell can be “merged” with adjacent cells, horizontally, vertically, or both, causing the resulting cell to look and behave like a single cell that spans the area formerly occupied by those individual cells. The top-left grid-cell in a merged cell has certain special behaviors. The content of that cell is what appears on the slide; content of any “spanned” cells is hidden. In python-pptx a merge-origin cell can be identified with the _Cell.is_merge_origin property. Such a cell can report the size of the merged cell with its span_height and span_width properties, and can be “unmerged” back to its underlying grid cells using its split() method. A grid-cell other than the merge-origin cell that is “occupied” by a merged cell is called a spanned cell. Intuitively, the merge-origin cell “spans” the other grid cells within its area. A spanned cell can be identified with its _Cell.is_spanned property. A merge-origin cell is not itself a spanned cell. SlideShapes.add_table() returns a shape that contains the table, not the table itself. In PowerPoint, a table is contained in a graphic-frame shape, as is a chart or SmartArt. You can determine whether a shape contains a table using its has_table property and you access the table object using the shape’s table property. A placeholder allows you to specify the position and size of a shape as part of the presentation “template”, and to place a shape of your choosing into that placeholder when authoring a presentation based on that template. This can lead to a better looking presentation, with objects appearing in a consistent location from slide-to-slide. Placeholders come in different types, one of which is a table placeholder. A table placeholder behaves like other placeholders except it can only accept insertion of a table. Other placeholder types accept text bullets or charts. There is a subtle distinction between a layout placeholder and a slide placeholder. A layout placeholder appears in a slide layout, and defines the position and size of the placeholder “cloned” from it onto each slide created with that layout. As long as you don’t adjust the position or size of the slide placeholder, it will inherit it’s position and size from the layout placeholder it derives from. The containing shape controls the position and size. Everything else, like accessing cells and their contents, is done from the table object. The cell is specified by its row, column coordinates as zero-based offsets. The top-left cell is at row, column (0, 0). Like an auto-shape, a cell has a text-frame and can contain arbitrary text divided into paragraphs and runs. Any desired character formatting can be applied individually to each run. Often however, cell text is just a simple string. For these cases the read/write _Cell.text property can be the quickest way to set cell contents. The merged cell appears as a single cell occupying the space formerly occupied by the other grid cells in the specified rectangular region. The formatting of the merged cell (background color, font etc.) is taken from the merge origin cell, the top-left cell of the table in this case. Content from the merged cells was migrated to the merge-origin cell. That content is no longer present in the spanned grid cells (although you can’t see those at the moment). The content of each cell appears as a separate paragraph in the merged cell; it isn’t concatenated into a single paragraph. Content is migrated in left-to-right, top-to-bottom order of the original cells. Calling other_cell.merge(cell) would have the exact same effect. The merge origin is always the top-left cell in the specified rectangular region. There are four distinct ways to specify a given rectangular region (two diagonals, each having two orderings). Note that the content migration performed as part of the .merge() operation was not reversed. """Generate each merge-origin cell in *table*. """Return str summarizing position and size of merged *cell*."""